This kit works with all BRS 6 Stage RO/DI or 5 Stage RO/DI Systems along with most other RO/DI systems that use 10" canisters. 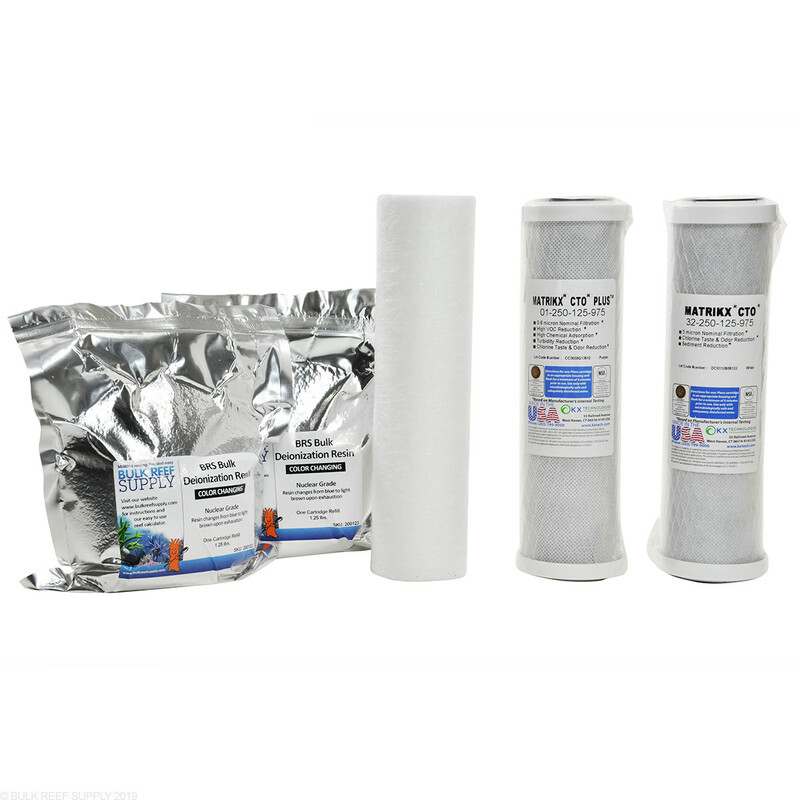 If your water supply is off a well, or your city uses chlorine to treat the water, Matrix Filters are a great value option and will effectively prepare your water for filtration through the membrane and also scrub the water of any remaining TDS after the membrane with the included Nuclear Grade DI Resin. If your city uses chloramines, we do suggest using the BRS 6 Stage RO/DI Replacement Filter Kit. 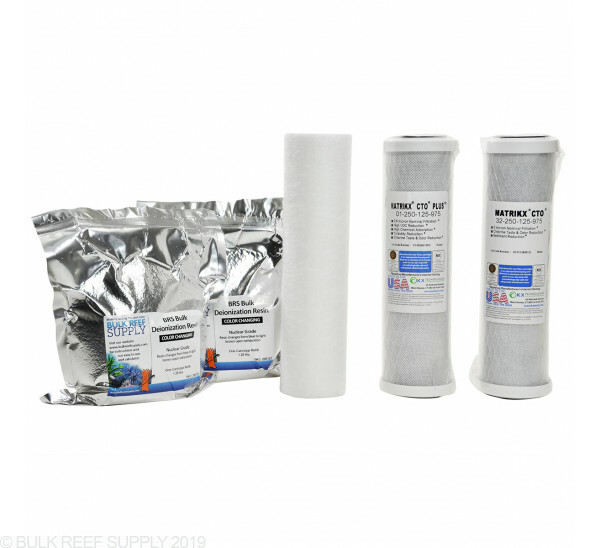 Our filter kits feature some of the most widely used and trusted brands in the world including GE, KX Technologies, and Pentek. The 10” filter size is the industry standard and will fit our systems as well as virtually every brand of RO system that uses similar looking carbon blocks. Most of the filters included in our kits NSF Certified or WQA Gold Seal Certified and Manufactured using FDA-compliant materials. *This is our recommended filter arrangement and we have found to be the best combination for the most common installations and water conditions. If you have something unique about your water supply or installation please contact customer service and one of our WQA certified water specialists will be able to assist you. Our onsite chat feature is the quickest way to receive advice but we are available to assist via the phone and email as well. Great filters for my RODI. Made about 50 gallons so far, and both tds meters I have on the DI are still at 0. Make sure you watch the BRS video on how to pack the DI cartridges! I like the convenience of these filter kits. The DI resin in each kit fills a 10" standard cartridge with a wee bit left over after packing. Just like they say it will. The best I have ever used. Thanks BRS! This kit is a very cost-effective method of replacing filters and resin. As a bonus, not only is it a great value... it's also very high quality. The sediment filter easily lasts twice as long (or more) as the cheap filters I had been using, and does a much better job of filtering out crud before it has a chance to clog the charcoal filters. This helps reduce changing the charcoal filters as frequently, and helps protect the RO membrane, which adds up to savings. The color changing resin is an outstanding product that is easy to replace. I highly recommend this kit to anyone who has a six stage setup. I have a 6 stage RO/DI with 2 DI Cartridges that I have to refill so I bought the 6 stage kit. The amount of resin I recieved is enough to fill my resin cartridges 4X ! Exactly what I wanted at a reasonable cost. Ordering was a piece of cake. Delivery was fast and efficient!